Celebrate Buddha's Birthday with a sangha dinner and by building a flowered pavilion together for the baby Buddha. 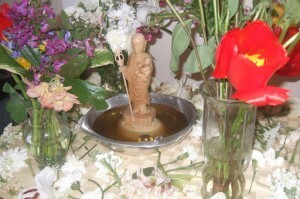 After meditation we will bathe the baby Buddha together. Bring flowers from home, a potluck entry if you can come early, and instruments: rattles, bells, little drums and such! Come celebrate! This will be our Wednesday evening program this week.